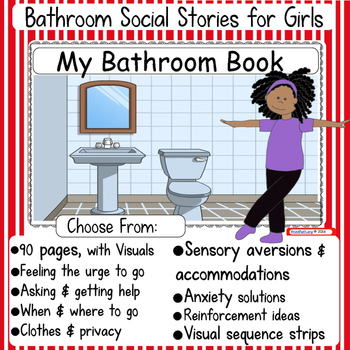 Every child is different and as special educators, we see many different bathroom issues during the elementary years. 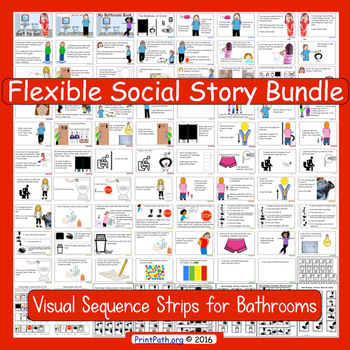 Choose from 7 book covers, 76 separate book pages with a corresponding visual to aid understanding, and 8 visual sequence strips for posting. Pick only the pages for your student’s needs. Specific sensory aversions that make it difficult for children with autism or anxiety issues to use new bathrooms are included. Clear consistent visual expectations as well as specific accommodations help make bathroom use successful! Editable text is available on two covers and four pages so that you can add your student’s name and specific circumstances that are important in your situation. Both photographs and clip art are used. This product is easy to use because of the detailed table of contents. Just read the table of contents and pick the pages that you need to print. You choose the cover and pages that fit the needs and issues your girl is dealing with now. Prioritize the problems. Pick only one or two issues that interfere the most, and after they are addressed, revise your book to help address the next issue. 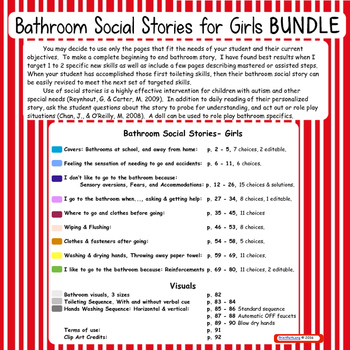 To make a complete beginning to end bathroom story, I have found best results when I include a few pages describing mastered or assisted steps as well. Materials are designed for girls 3 to12 years old who are pre-menarche. Read tips for parents and teachers on how to make the process of using public bathrooms fun, interesting, and successful @ Capitals First Blog by Print Path. @ Capitals First Blog by Print Path. Covers: Bathrooms at school, and away from home: 3 choices, 1 editable. 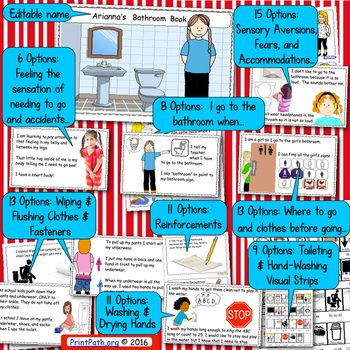 I don’t like to go to the bathroom because, Sensory aversions, Fears, and Accommodations: 16 choices & solutions.